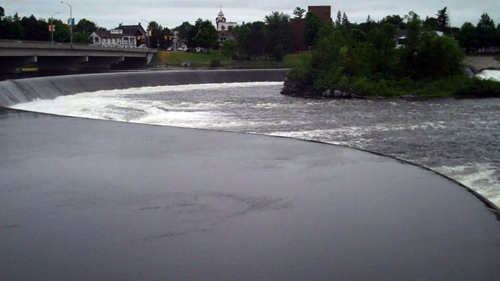 A ‘weir’ is a curved dam. 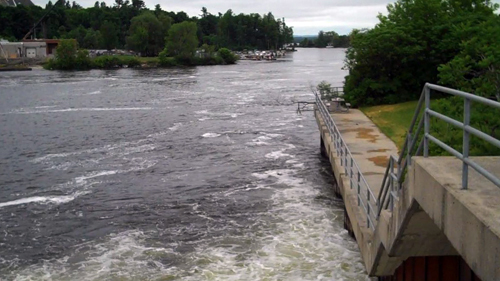 This weir is on the Madawaska River in Arnprior. The island is where the fire department volunteers set off the fireworks on Canada Day (July First). -Love the dramatic curves. You can just about make out the Museum’s Tower just left of center in the background. Weir and Island to the left, Church and Construction across the river. 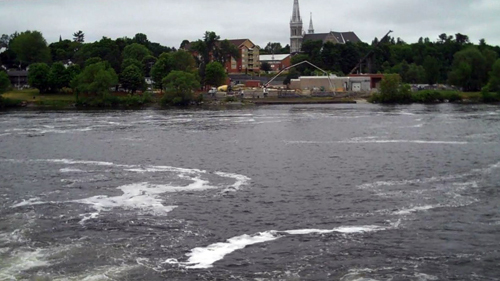 The Madawaska flows into the Ottawa River at Chats Lake beyond the trees. Looking slightly East of North (I think). Construction to the left across the water, beyond the trees on that side there is a park and a beach on Chats Lake. Jutting out into the river on this side is a boat club, another park, and a rocky point. Chats Lake is a pretty darn wide section of the Ottawa River. I’m thinking it’s at least a mile wide here. Quebec on the other side.